Here's Screenshot Saturday number twenty-eight for OddBall. The past few weeks have been busy, not just with holiday stuff, but with OddBall development. I spent a good part of my 8 days off working on the final battle levels for OddBall. This includes new background graphics, coding and modelling some new game objects, and creating a series of linked actions that need to take place seamlessly as you battle through the last few levels. As I've mentioned before, the final battle levels take place after various details of the OddBall facility are revealed. At this point the player must make a decision by choosing one of two sides. As a result, there are three different endings depending on how you handle those choices. Today's screenshot shows the first battle level where the player learns what they must do in these end battles. There is a red rocket launcher moving back and forth infront of two windows. The player must use their OddBall tactics to access and activate the red buttons in these last few levels. 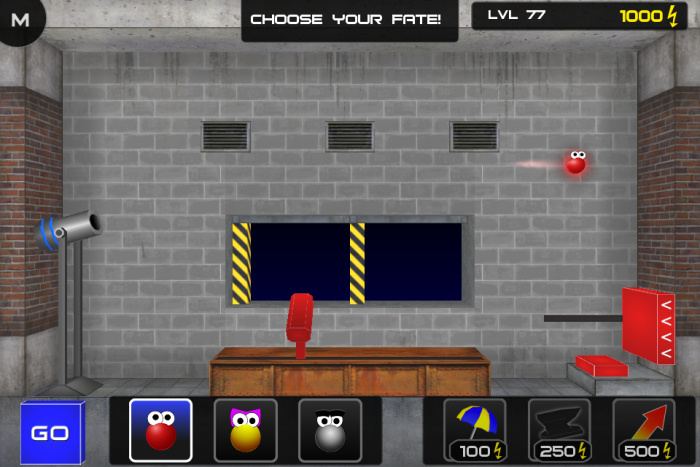 Activating the red buttons will pause the moving rocket launcher and fire a rocket out the window at your target. Or, if you choose the side that is not to fire at the target, you need to protect yourself from incoming rockets by firing at the yellow and black window braces instead. Doing this will close the window shields and protect the player.